Overall I was very happy with my gear. There were very few items I replaced or would have wanted to. Some items I realized I spent too much money on at the beginning, only to replace them with cheap versions of themselves when they broke down part way through the hike. Here’s a quick recap of nearly all the items I carried. If you want specifics, ask questions in the comments below! This sleeping bag was very comfortable to sleep in on a mild to chilly night, but when it got cold it was cold. My bag was rated at 20 degrees F. I was jealous of Jill’s 10 degree bag, which kept her nice and warm. I was also jealous of other’s bags that had hood attachments. I used my clothing to help keep myself warm, but I wish the bag was a little more effective. It was mostly the cold desert nights at the beginning of our PCT hike that got to me. The bag was very compact and light to carry—fit inside my backpack perfectly under my food sack. It’s a stuff sack. It didn’t tear or leak. I loved my backpack. Lots of other hikers commented on the weight (somewhere at about 4 pounds), saying it was a bit heavy. But the weight gave it strength and ventilation I could see was lacking on many other thru-hikers packs. It was incredibly comfortable. My back stayed dry in hot weather. The big hip cushions were nice. The pack had zippers and pockets everywhere, some I didn’t even find until halfway through my hike. The zippers and pockets may have added to the weight of the pack, but I always knew where every single thing I had was at any time. Everything had its place. On the downside there were no hip pockets (though I could have bought some to attach if I really cared) and the big bottom pocket’s zipper was difficult to open and close, which I saw on other reviews of the backpack before I purchased it. I’m going to keep using this pack until it is torn to shreds! Weird design, but quite comfortable. Took me many less breaths to fill my air pad than most other hikers. I loved the attached pillow. The holes were never uncomfortable unless the inside floor of our tent ever got wet because then the moisture would soak through into my sleeping bag. I like it enough to keep using it. It worked for a while, but would eventually get torn to shreds. I think I replaced mine three times on the hike. In damp conditions every bit of dirt and foliage would stick to it, which was annoying when I had to roll it up and put it in my bag. Tyvek seemed like a better alternative. Good shape and length. Never broke. Easy to clean. Tested this headlamp out before the hike and it worked fine, but it failed me the few times I tried to use it. Swapped out batteries a couple of times, but they always seemed to drain very quickly. Eventually the battery clasp broke and I threw it away. Bought a cheap replacement in Burney that worked better but didn’t have all the adjustments I would have wanted. It survived the thru-hike, but over time I grew more and more annoyed with my Sawyer. The bag it came with broke right away. The gasket inside started giving me troubles until I realized that I should not screw my smart water bottles onto it all the way (three quarters of the way seals the filter but will not tear into the gasket). When the flow slows I would clean it, but each time I back flushed it the cleaning seemed to be less effective. Didn’t really seem like anyone else had a solution or better alternative, though. Went through several of these. They held up through the desert where I needed them, but they all broke eventually. The plastic separated up near the nozzle on each one. They were convenient while they worked but I eventually just switched to carrying all of my water in smart water bottles. I didn’t need the extra capacity after the desert anyway. Dug holes well enough. Light. Small. Easy to carry. Didn’t break. Went through two on the entire hike, but I had to take good care of them. Other hikers went through many more. They are easy to puncture and the gaskets tear if you don’t take care when opening and closing them. Kept rodents away, though. I never had a mouse chew through any of my gear. I used this as a food bag for a while. We had to switch to bear cans and after that I just used the OP sacks. This expensive bag just turned into a trash bag for me and got all scratched and torn by the end of the hike. Never had a bear issue. It was uncomfortable to carry, but I think any bear can would be. Fit all of my food (most of the time). I liked that the container was clear so that I could see where my food was. Worked well as a seat. I like it a lot, but I never used it on the trail. I never even mailed it to myself. By the time we made it to the Sierras we decided it wasn’t going to be icy enough to warrant carrying the axe. We could have used it for climbing Mt. Whitney, but it would have just been to ease our fears. We made it up and down the mountain just fine without our axes. Never even tried these on. We did mail these to Kennedy Meadows but the package never arrived (the post office still hasn’t found it to this day). Could have used them on Whitney like the ice axe, but we made it just fine without them. Kept me incredibly dry in rainy/snowy/haily weather. Great for that. I had to constantly adjust pit zips and front zip and hood on/off so that I did not sweat myself soaking wet. Kept my pack perfectly dry as well. The worst downside was that to get to my pack I had to take off the entire poncho, but it wasn’t an issue very often. Just a really good rating for how dry it kept me. Kept my hands warm on many days and many many nights. The wool helped to keep my hands warm in wet weather, but not as well as a waterproof shield would have. I was deceived, too. I thought the gloves were entirely wool, but the wool outer layer started to wear away and reveal the cotton underneath. A little disappointing. Great for resting and sleeping. Not great for hiking because I would sweat and the wool would itch. Kept my ears warm. I wore a thin headband while cold hiking. Not as warm as I would have liked, but it was on a steep discount at an REI garage sale. Usually I am a very warm person, often too warm. On this hike I found that as I lost a lot of weight very quickly I needed better gear to keep me warm. This jacket didn’t cut it, but I just kept adding layers when I needed. Would have liked a hood. Though they were very comfortable to hike in, each pair fell apart within days. I just started the hike with half a dozen pairs of my old work socks. By Tehachapi I burned through them all and went for some Darn Toughs which were amazing. Great company. Great product. Wear Darn Toughs. Mostly wore this for two weeks in the Sierras when we had the worst mosquitos of my life. Carried it the rest of the hike because it was so compact and the weight was insignificant. Amazing light jacket. Great for wind and light rain. It’s a biking jacket, but it was very comfortable and because it had no front pockets it didn’t rub awkwardly on my pack straps. Didn’t get dirty easily and I often put it on when trying to hitch a ride because it looked so nice. Did not like. I got rid of it pretty quickly for a cheap, regular toothbrush. I saw many other hikers ditch these into hiker boxes as well. If you have glasses get a strong, sturdy case. My case was very solid and still broke at the hinges, but it kept my glasses safe. Used gauze a few times. Worth carrying. I carried way too many backup contacts with me the entire trip. Just mail them as you need them. Used it as eye drops a lot. Never had a major emergency but I did use a few items from this kit. Compact. Use it every time you poop! Plenty of people got sick and blamed it on a variety of things but I believe that many people just did not wash their hands properly. Small, single-ply rolls worked best for me. A MUST in the desert and the Sierra Nevadas for pale skin. The snowy mountains will get you worse than the desert. Be careful. I carried it for fun but it was completely unnecessary. The most I did with it was slice an avocado. Great conversation piece, but I sent it home after the Sierras. Jill’s Leatherman multi-tool was much more useful. Favorite piece of equipment on the entire hike! I took many pictures and videos and did not fill up the card space. Takes amazing scenery and landscape photos. Was everything I wanted it to be. I screwed it in like a tripod mount onto the top of my hiking staff. Kept it that way the entire hike. Battery life was excellent, though I had to make sure my wifi stayed off otherwise it would drain fast. Had some issues at the beginning of the hike because there is an easy to push button which turns on an LED flashlight, so the battery drained often. It was frustrating. Once I found a way to keep the battery in my pack without anything pressing on that button the issue went away. The battery size was large enough to keep my phone, Jill’s phone, and the GoPro charged for seven days or more without limiting our use. Excellent for blogging, navigation, and every other thing you can do with an iPhone. I had ATT and service was ok throughout the hike, mostly what I expected it to be. Jill’s Android sometimes had a better cell signal than I did. My iPhone would often receive good GPS signals for Halfmile’s app when Jill’s Android did not. A couple of weird issues with the WordPress and Instagram apps at times, but I always found a workaround. Held up through nearly the entire hike. Both hinges broke and the bottom piece was no longer water tight, but it was snug enough to still fit together. It was quite ugly and white was not a good color for it, but my call quality was just fine and it kept my phone moisture and dust free. Wore it the entire hike. The shirt was tight around my chest on arrival from REI’s online store, but Jill’s mom helped me let the shirt out near the shoulder blades and we installed some ventilation spots with some light, stretchy fabric. Very comfortable in all weather conditions. The only part that ever tore were those vents near the end of the hike, the rest of the shirt remained intact. Didn’t use them for sleeping. Well I did at first, but after 1000 miles I just slept in my hiking gear every day. I used these shirt in towns, though. The wool kept me from stinking too much and they were more presentable than my hiking clothes. Many other hikers didn’t care about their stink or appearance in town, but I did a little. Very comfortable but not worth the price. I replaced these halfway through the hike because they were too torn up. My replacement was some cheap Walmart shorts which worked just as well. This debate among thru-hikers will never end. Which shoe is best? I can’t tell you if these were the best, but they were great for me. For my entire thru-hike I wore two pairs of Cascadias, minus 300 miles with boots (see below). They were comfortable and did not tear apart until many many miles of hiking were put on them. My first pair was sent home at Kennedy Meadows, and only because I received my Sierra boots there. After the Sierras I walked from Sierra City to Canada on one pair of Cascadias. I threw that pair away, but I’m still wearing my first pair, the ones I sent home at Kennedy Meadows, today. The ‘9’ is the important part. Others who wore the newer ‘10’s had many issues. The new design simply did not support a thru-hikers feet. My ‘9’s were excellent. Very glad that I wore these in the Sierras. They were indestructible. All of the rocks and streams and mud in the Sierras were no trouble for me. I marched right through it all while watching others struggle and take long alternates to avoid what I could walk right over. Sent them home in Sierra City because they are very heavy and were not worth wearing other than in the extreme Sierra terrain. I had to treet my feet differently while wearing these boots. Where in my Cascadias the ventilation let in so much dust and dirt I had to work to keep my feet clean, in these waterproof boots my feet were always clean but I had to work to keep them dry (from my own sweat). Not a big issue, but just something to be aware of. Rotated two pairs the entre hike. Still wear both pairs today. Very comfortable. No chafe. Look cool. They worked great but got scratched up and I lost them eventually. Only item I lost on the hike, I believe. Replaced them with some cheap grocery store polarized glasses which worked just fine. I did have a large straw hat for the desert, but this hat served me well the rest of the hike. Good just to keep my hair back and for the minor sun protection it provided. Many thought it was weird that I only had one pole, but it was all I needed. This staff was great for helping me keep my balance on stream crossings. It helped lift me and lower me when I needed it. It held my GoPro the entire hike. I liked having a free hand to grab water or snacks with. Lasted the entire hike and I’m going to keep on using it! Hi, just discovered your blog a few weeks ago and have been reading it all, great blog, thanks 🙂 I just wondered if Jill did a post hike gear review also? 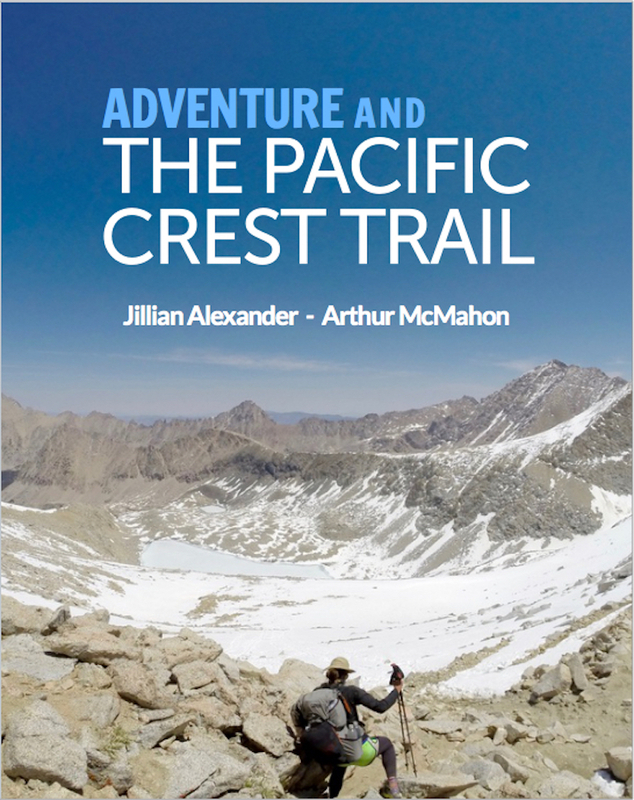 I found this review very useful but as a female hiker, would love to hear Jill thoughts too! Hi Carrie! I haven’t written a gear review, but if you have any questions I’d be happy to answer them the best I can. You can email me at alexander.jill9 at gmail with any questions. Thanks for the gear tips, ideas for Christmas gifts for the next generation of hikers in my family. Da. is 42, and son turns 40 soon, but dad and kids are always up-grading what we have. Darn Tough socks go on MY gift list! Remember, B&B for you two when you return to Seattle. Glad the info helps! We’ll remember you guys next time we swing through Seattle for sure. Thanks!